We in the Department of Medicine are one faculty. But we practice our mission-based activities at more than one place. While we began our journey at the Johns Hopkins Hospital (JHH), Johns Hopkins Bayview Medical Center (JHBMC) joined in in 1984. 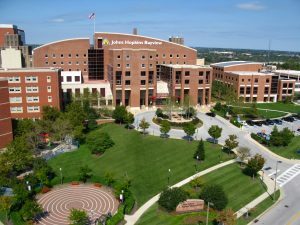 JHBMC, formerly the Baltimore City Hospital, brought with it opportunities for important new programs that align with our tripartite mission. Notably, JHBMC is home to the Center for Innovative Medicine, and the Miller Coulson Academy, programs that have transformed healthcare across our health system. JHBMC has seen the development of important clinical, educational and research themes such as pulmonology, addiction research and treatment, bariatrics, immunology and aging. Bayview is also the home base of the Divisions of Allergy and Clinical Immunology, Rheumatology, Geriatric Medicine and Gerontology, among our most celebrated specialties by U.S. News and World Report. We have made great strides in uniting our department across both campuses, but, in collaboration with David Hellman and you, it is my goal to unite us further. I greatly support our providers seeking credentialing at both locations, distributing our greatest assets (you!) equally. The Division of Cardiology has gone so far as to harmonize clinic schedules to allow people to move between settings more easily. Sherita Golden is leading an initiative to improve our understanding of obstacles and opportunities for enhanced integration between the East Baltimore and Bayview ‘wings’ of our department. When recruiting our most recent division directors, we sought out individuals who would develop programs at both JHH and JHBMC, and we found that in Rex Ahima and Chirag Parikh who have taken us closer to this goal. Outside of our department, with the hiring of Kevin Sowers, we have entered into a more explicit phase of becoming an integrated health system. Part of this journey will require us to think beyond place in order to expand the reach of our mission to be at the forefront biomedical discovery, teach the next generation of doctors and scientists and the improve the health of our community and the world.